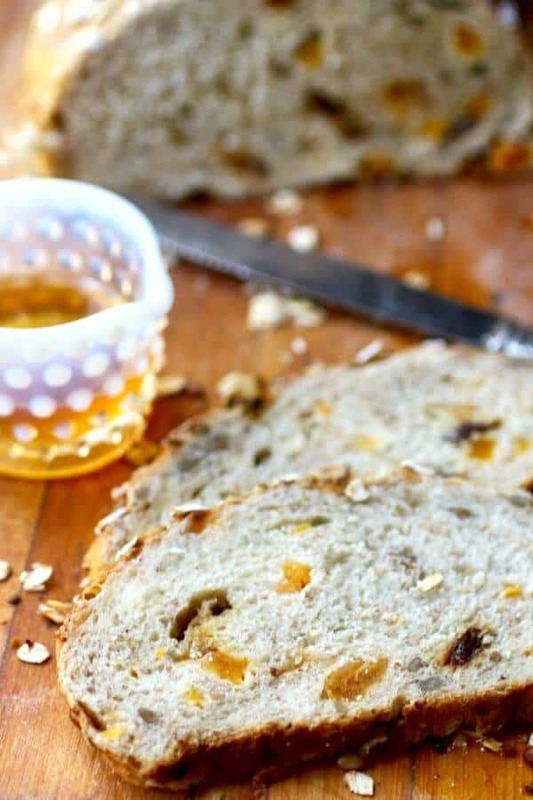 Every bite of this delectable harvest bread is loaded with sweet dried fruit, crunchy nuts, and chewy whole grains. You can use whatever mixture you like – I chose a combination of raisins, apricots, and sunflower seeds this time. It’s obsessively yummy as toast and makes incredible chicken salad sandwiches. 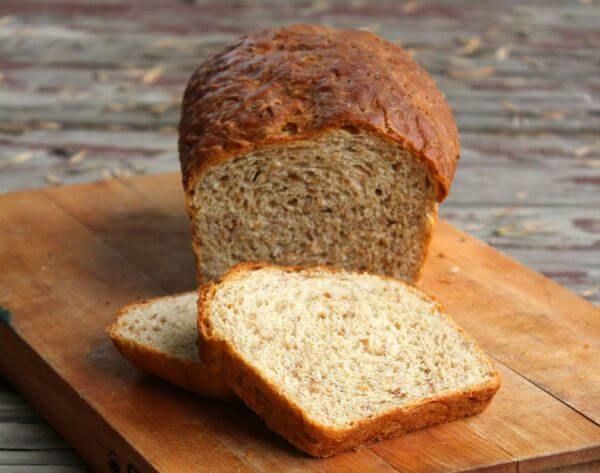 If you’d like a wholesome bread like this but without the fruit try my Oatmeal Walnut bread. SO good! This recipe was first published in June 2007. Last updated October 2016. This bread is delicious but if you’re looking for a good, plain sandwich bread then try the honey buttermilk bread. It’s the most popular recipe on the blog! 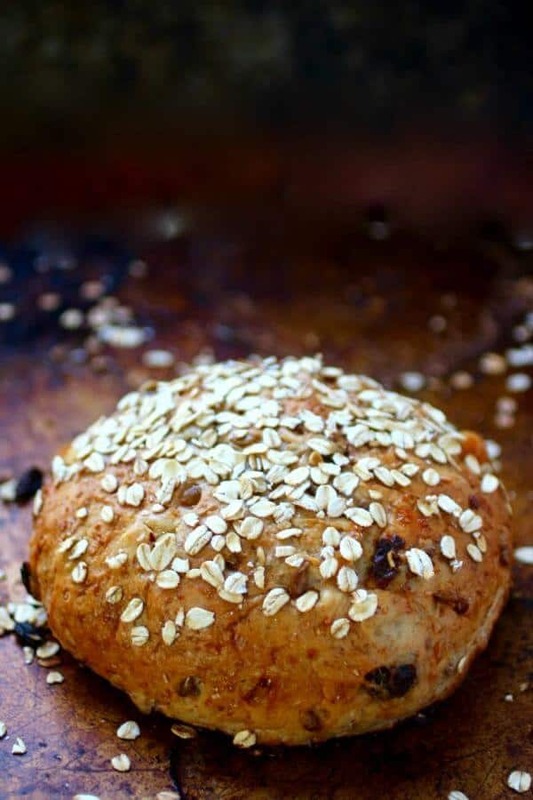 Every time I post a bread recipe I seem to say, this is absolutely my favorite bread! and honestly it’s not a lie. My favorite loaf of bread is always the one I’ve just made! This harvest bread is special to me because it’s the first loaf of yeast bread I’d tried with whole grains mixed in. I’d made raisin bread and cinnamon bread before but never anything with whole grains. It was the 1970s and let me tell you, whole grains were the ingredient of the hour. In the days before the AMA decided that fat was deadly to all people and eating an egg was suicidal wholesome was anything that contained whole grains. You could make a chocolate chip cookie with whole grains and it would be touted as old fashioned and wholesome. We were the last of the Baby Boomers. Watched our parents sipping cocktails in their polyester designer clothing. We’d been fed vegetables from a can, TV dinners, and squishy white bread. Rebellion against all of the trappings of the mid-century middle class meant that we shunned commercialism in everything. Homesteading became a thing. Tiger Beat and 17 Magazine were tossed aside in favor of Mother Earth News. We hand sewed cotton patchwork maxi skirts, learned to knit, and made bread by the bucketful. The Little House on the Prairie series of books was our Bible. The 1960s were actually the last decade of innocently eating food without thinking about fat, cholesterol, carbs, or sugars, in my opinion. If you were a few pounds overweight you went to Weight Watchers for a few months and got back in shape. Easy -peasy. Anyway, I love this bread. I can literally eat an entire loaf by myself! It makes great dinner rolls, too. Harvest bread requires a longer baking time than you may be used to because of the amount of dried fruit in the recipe. The fruit releases moisture and the bread will be soggy if not cooked long enough. The benefit to that is that it will stay fresher longer. This multi-grain fruit and nut bread recipe is good made into an oblong loaf shape and sliced for sandwiches (try a chicken salad, or peanut butter) or made in a cloche or oval. It makes great French toast, too! Any grain combination of flour that you like is fine — just maintain the total number of cups. Use at least half white flour or use at least 1/2 cup of vital wheat gluten to give the dough elasticity. I used white flour, whole wheat and (dry) oatmeal in this one..but have used soy, rye, bran, cracked wheat and other combinations in the past. Use a mixture of whatever kind of dried fruit you like but make sure that the pieces are similar in size. Dice dates and figs, for example, so that they are about the same size as the raisins in this recipe. Doing so will help to ensure even distribution of the fruit and a better texture overall. You may want to check out these tips for working with yeast breads. This bread freezes well for up to three months. This harvest bread is pretty easy to hand knead if you want to. I kneaded that way for years and had no idea that a mixer could be used for kneading until early in the 1990s! If you are unsure how to knead bread here’s a video I’ve made to demonstrate. Vital Wheat Gluten adds springiness to the dough and helps it rise higher and lighter. I like Bob’s Red Mill and like to buy yeast in huge packages because it’s SO inexpensive that way. I pretty much only use Red Star. You’ll find more great products for your bread baking adventures in the Restless Chipotle & Co. Storefront! Here’s that Harvest Bread recipe! If you’re looking for a great breakfast bread try this old fashioned homemade honey bun recipe. 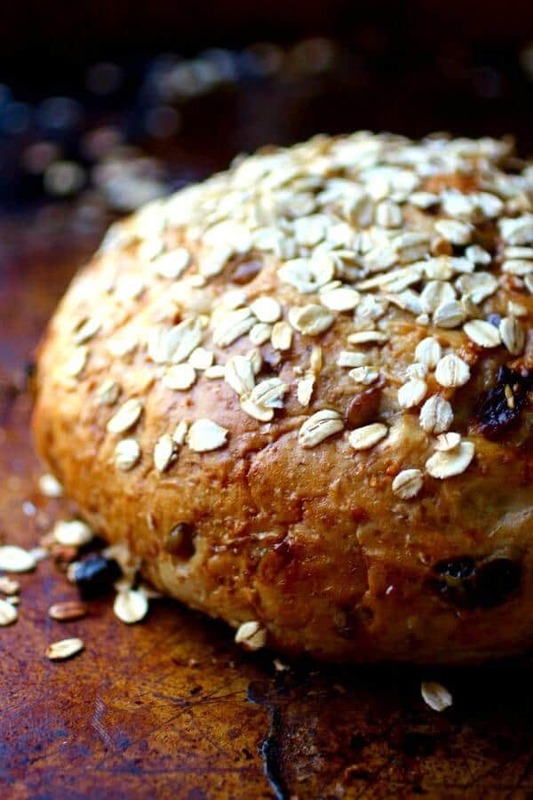 A hearty, peasant style loaf that it studded with fruit and nuts. It is absolutely delicious toasted for breakfast. 1 3/4 cups warm water, 105 F. to 110 degrees F.
Place warm water in a large bowl. Sprinkle yeast and then honey over the top and stir to dissolve. Gradually mix in 2 cups bread flour, the gluten, and 1 cup whole wheat flour ( or 1 cup of your mixed flours). Cover yeast mixture with tea towel and let stand 30 minutes. Stir shelled sunflower seeds, fruit, butter, and salt into yeast mixture. Gradually stir in enough remaining whole wheat flour to form soft dough. Knead dough on floured surface until smooth and elastic, adding more whole wheat flour if dough is sticky, about 10-15 minutes by hand or 6 minutes by mixer. Place dough in bowl, turning to coat completely. Let rise in warm draft-free area until doubled and dough does not spring back when 2 fingers are pressed into side, 2 hours or so. Grease pans. Shape dough into desired shapes and place in pans. Let loaf rise in warm draft-free area until almost doubled in volume, about 45 minutes. 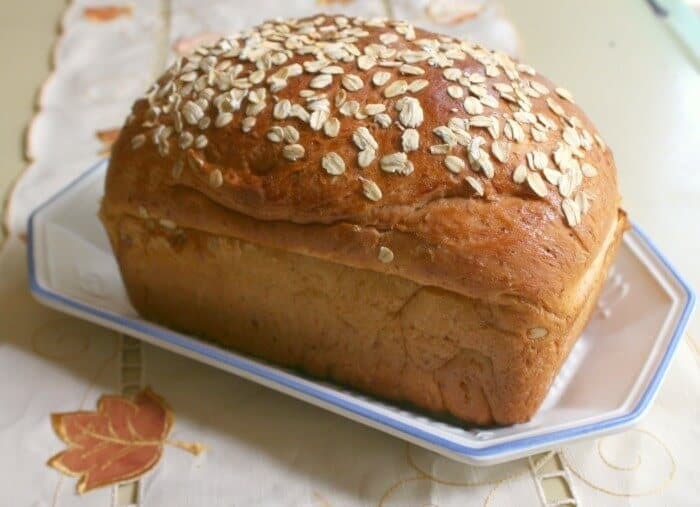 Brush top of loaf with egg and sprinkle rolled oats over the top, or dust with flour or cornmeal. Bake until golden brown, about 45 minutes to 1 hour., depending on the shape and size of your loaves. Serve bread warm or at room temperature. Makes 1 or 2 loaves, depending on shape. Included in Meal Plan Monday #82 – Check out all the great recipes! Afraid of making a yeast bread? Fear no more. This recipe is so easy and delicious!! And it’s 100% whole wheat. I’ve always been intimidated by the thought of making a yeast bread. All the kneading, rolling, punching, kicking :-). Thanks Michelle! I am so glad you like it! This is a bread which my mom would LOVE for breakfast! ? I’m not sure what bread flour is? Are you able to substitute All Purpose Flour or any other Flour? 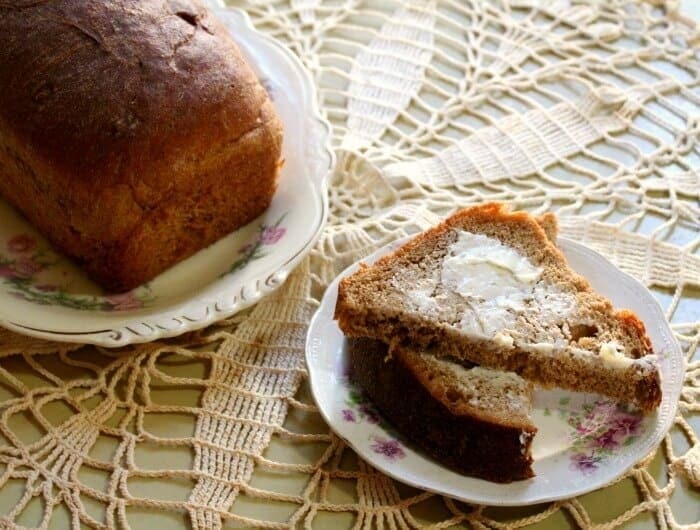 Are you able to bake this bread in a bread machine? I’m looking forward to making this delicious bread. Thanks for sharing!! ? Bread flour is a higher protein flour for bread baking. It should be right next to the all purpose flour at the store. You can substitute all -purpose flour but if you do be sure to add vital wheat gluten to get a better rise. I am finally overcoming my “doughaphobia” and baking bread. I love the stories you wrote along with this and am very intrigued by the add-ins for this bread. I haven’t tried vital wheat gluten yet but have now seen it twice in the last couple of days so maybe it’s time to buy some! It makes amazing toast with butter and orange marmalade!